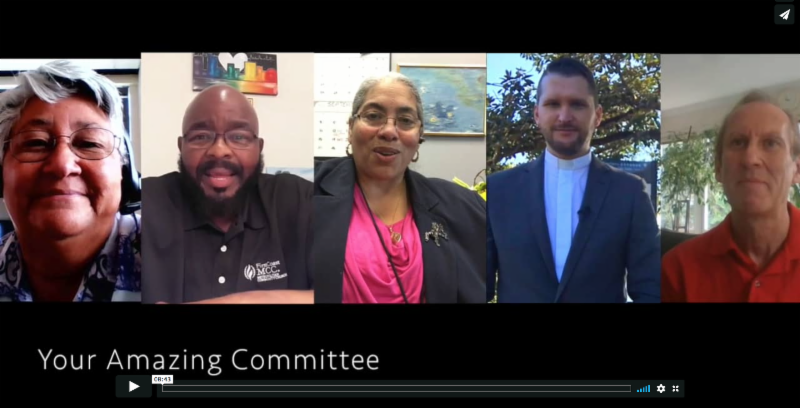 Greetings from the 2018–2019 MCC Moderating Nominating Committee! All five of us are excited and honored to be serving our denomination in this critical task of presenting a slate of highly qualified and called candidates for you to vote on at our 50 th Anniversary 2019 General Conference next July in Orlando, Florida, USA. In our first report, we would like to share a little about ourselves and the timeline for our work. Our sincere hope is everyone throughout our denomination will take an active role in our work by praying for us, giving us your input and by nominating individuals you believe would be great potential candidates. We have established an email address to receive feedback and questions from anyone in MCC. That email address is MNC@MCCChurch.net . We welcome your input as we embark on this task and will be glad to answer questions about procedure and timelines.  Do keep in mind, however, we cannot answer confidential questions about our ongoing work (i.e., such as if a particular person has been nominated, etc. ), nor questions sent to individual members of the MNC. As we engage this work, we believe it is important for you to get to know us! So in this first communication, we are pleased to share an 8-9 minute video where we introduce ourselves in an effort to allow you to know a little more about each of us. It is exciting for all of us to be part of such a strong, uniquely diverse team and to experience a deep sense of unity from the time we commenced our work! 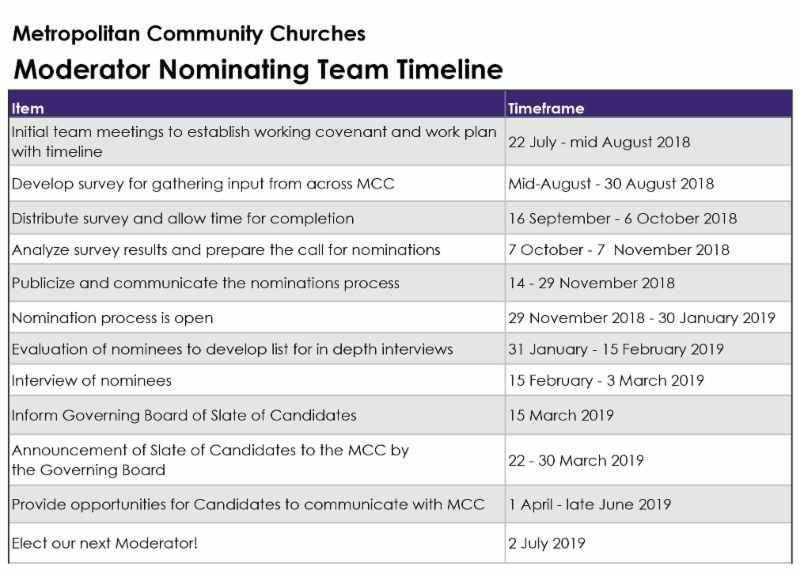 In addition, we will also update the Moderator Nominating Committee webpage with all the information we publicize so you can find all our ongoing information in one place. In our discussions regarding providing updates to you as we engage this work, we decided to first provide you with the MNC Work Plan and Timeline and then send out additional communications at key times during our process (i.e., for example when we send out the global survey for your input or publicize a call for nominations). We will also strive, if invited, to be available (either in person or via video call) for Network Gatherings to answer questions about the process and timeline. May God’s spirit of peace, wisdom and unity work in and through us and our hearts during this exciting time in our fellowship’s journey! Metropolitan Community Churches is celebrating 50 Years! Founded in 1968, Metropolitan Community Churches (MCC) has been at the vanguard of civil and human rights movements by addressing issues of race, gender, sexual orientation, economics, climate change, aging, and global human rights. MCC was the first to perform same gender marriages and has been on the forefront of the struggle towards marriage equality in the USA and other countries worldwide. MCC recognizes a state of need around the world in the areas of human rights and justice, including the Lesbian, Gay, Bisexual, Transgender, and Queer communities. As people of faith, MCC endeavors to build bridges that liberate and unite voices of sacred defiance. MCC leads from the margins and transforms. or unsubscribe if you no longer wish to receive MCC news.